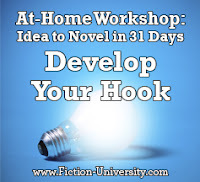 Welcome to Day Two of Fiction University’s At-Home Workshop: Idea to Novel in 31 Days. The first twelve days will focus on developing the story and getting all the pieces in place so we can more easily plot the entire novel. Today, we’re working on developing that all-important hook. Hook is a term used in a variety of ways. It might be the hook of a query letter, a hook to make a reader keep reading, or a hook line in the text that stands out and makes a reader smile and think, “Great line.” No matter how it’s used though, a hook is anything that makes the reader want to read more. It “hooks” the reader, captures attention, and piques interest in the novel. 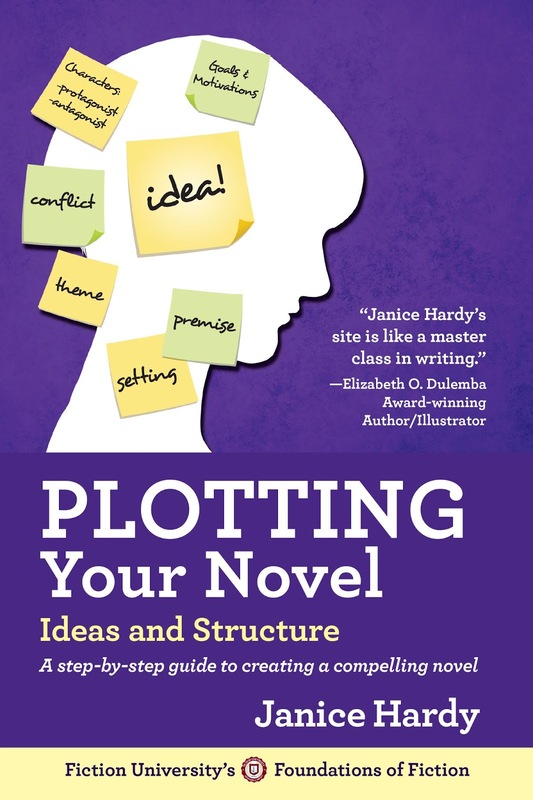 In the brainstorming stage, the hook is the gotcha—it’s the twist that will make the novel compelling and fresh. It’s the “ooooh” factor that probably got you excited about the idea in the first place. It might be a plot point, a character goal, or a conflict. It could even be the theme. In harsh terms, the hook is why a reader (or agent) should care about your book and not pick up someone else’s. It’s also how readers choose the novels they read, because one book will stand out and be more appealing than another—one “hooks” more than the other. If you’re just writing for fun, a hook isn’t vital, but if your hope is to one day publish a novel, a good hook is a necessity. Explore what’s compelling and different about your novel. 1. List three critical things about your protagonist. 2. List three critical elements of your conflict. 3. List three critical things about your theme. 4. List three critical things about your setting. 5. List three critical things about your novel concept. EXERCISE: Write down your novel’s hook. While you want to find the “ooooh” factor, this hook doesn’t need to be agent-ready quality. Focus on what makes your idea fresh and compelling. 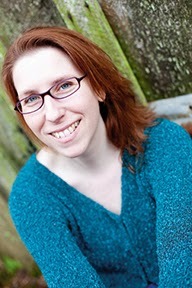 You’ll also have time to develop this further as you learn more about your novel and characters. Those following along with the PYN book: Workshop Three goes into more extensive detail on developing your hook, with exercises and examples to guide you. Tomorrow, we’ll look at what will drive our plot. This hook lesson makes me think. I hadn't considered so many books. Great insight, as always. Thanks! You don't need them all every book of course, but the stronger we make all of them, the better the book tends to be. Really enjoying this series. I'm using it to keep me on track with my current WIP, since I've decided NaNoWriMo isn't for me. Thanks! It's not for everyone :) I've done it several times and enjoyed it, but I always seem to get swamped around this time of year. Oh, good, you defined types of hooks stories can have. Thanks. I don't remember reading anything but: 'Do a great hook' before. And it seems like I've read thousands of writers books. NaNoWriMo didn't work for me either (replying to Dominique). I don't do deadlines well, it made me Not want to write for a couple weeks after, that was way counterproductive to me! But I enjoy their information. Most welcome :) It works for NaNo and non-NaNo folks alike.